As a partner in a business involving real estate and property managment, I often relied on the opinions of the two partners who were real estate agents. When AirBnB sponsored legislation in our state, the partners looked to me to keep them informed on the progress of the bill. Although none of us actually abdicated our authority as partners, we often deferred to others in their area of expertise. 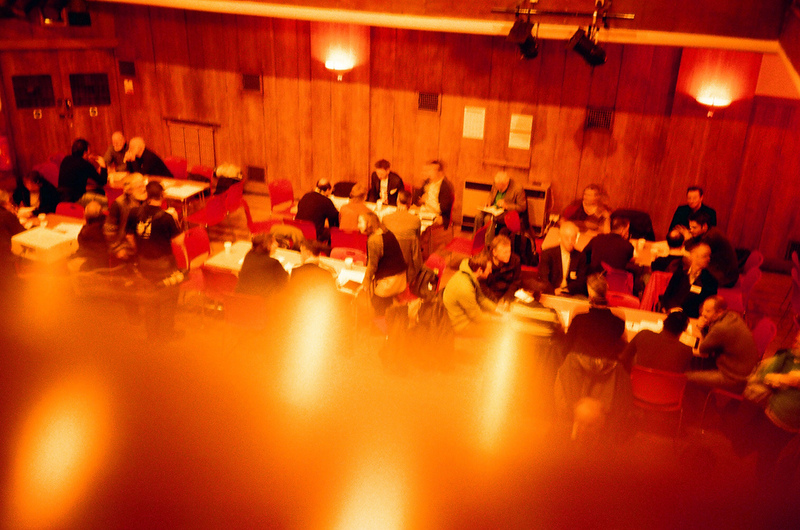 Our previous installment in the Democracy series highlighted sortition, a democratic process in which randomly chosen representatives deliberate on behalf of the larger community. This final installment features liquid, or delagative, democracy. Represent.me is a democracy platform featuring the ability for members to delegate their votes to trusted others within the community. We are a dedicated and experienced team who believe that the most enduring way to make the world a better, safer, happier place is to improve how political decisions are made. We believe that creating an ever-better civilisation should be enjoyable and something we can be proud of. We’re making it easy to be a part of it. Represent.Me is a versatile, people-first democracy platform. It lets you have your say on any issue, build a personal political profile, and use it to engage in a direct and delegative democracy platform. It’s currently being used by groups in the UK to communicate the voting public’s opinions to both their communities and representatives. With users in 57 countries it is already a powerful tool. The project makes it easier for users to separate issues from personalities, build consensus, identify the best representatives, and more effectively collaborate with with decision makers. The project is currently focusing on their back-end API and are actively looking at how it can plug into other experiences (e.g., #project-swimmy) as well as build a Tinder-style front-end (i.e., #everyonevote) to make engagement easy and use simple. This toolkit for modern democracy is delivered via a powerful API with a CC-BY-SA license. Why is this better than submitting evidence directly on the Government website? In short: Represent makes it easier, faster, gives clearer insights, and is a lot easier to get started with. On the Government website this is a ‘yes / no’ with a textarea. Take a moment to think how you’d answer that. It’s hard, right? It’s open-ended, and has a lot of assumptions in the question. We break the question apart to make more questions each of which are much easier to answer. Still want to comment? Each question has its own comments section. We analyse it and submit it to the Government as part of their inquiry. We have a relationship with them which lets them accept submissions direct from Represent as a channel for public representation. 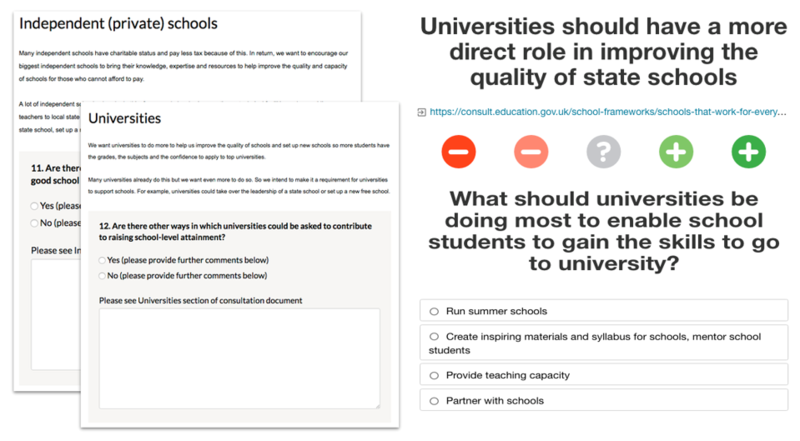 But it doesn’t stop there: because you’ve answered on Represent it’s automatically aggregated and shown to your MP, your local authority, and other agencies who can help deliver what you want. Naturally you don’t want spam, and your security comes first so no one can contact you directly via Represent until you permit them to. You should have had a dozen Xs on the EU Referendum ballot paper. If you’re smart enough to have an opinion on austerity, migration, economy, taxation, environment, free movement, health care, welfare and more, then your opinion should count and set our direction. And now that opinion counts more than ever, because we’re on our own. This is our future we’re creating?—?right here, right now. exists to map the world’s opinions and values so that we might find better ways of working together for the greater good. But if we’re to represent people globally, we are going to need some really good maps and really clever data manipulation. Which is why I am so incredibly proud of our tech team who have done all that, and made it ridiculously fast, too. Represent now has county / state level opinion mapping for almost every country in the world. We start at “well we should all be able to vote on everything”, but then realise we don’t want to vote on everything and also probably don’t know enough detail to trust ourselves. So we need people we can trust to vote for us (delegates) on specific topics. Of course, this is how it most democracies currently work: Every 5 years you delegate your votes to one MP who takes all those decisions for you. With delegative democracy you no longer have to choose least-bad. You can cast your vote in line with your values. Of course you may not get what you want (51% may think that your education choices are terrible) but it will have greater influence. Eg if your education preferences get 20%, the group that gets 35% may say “we can blend these ideas and have 55% – a winning majority”.